In today’s digital ecosystem, your business conversations generally start and end with an email. 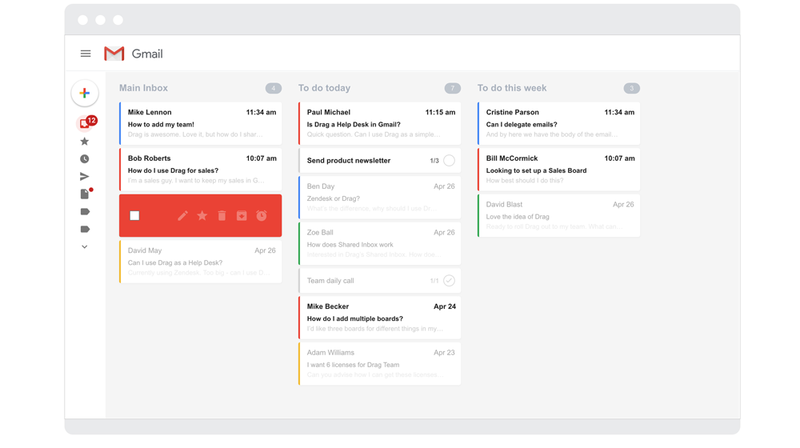 Drag is a Chrome extension which turns Gmail into a Kanban board with a visual layout for managing your conversations and tasks. Drag was created to reduce the time users waste in their inbox by integrating the functionality of tools such as Trello. Drag turns your inbox into a project management, marketing, CRM, collaboration, and help desk tools without having to switch back and forth between applications. For small business owners, Drag will not only save you money, but it is integrated into the most popular PC browser and email client, Chrome and Gmail as well as GSuite. Because everything is in a centralized inbox, your entire team will be more efficient and productive. According to Drag, “Most emails are To-Dos. Why do task management tools and Inboxes need to work separately? You live in your Inbox, so should the things you need to get done,” which makes a lot of sense. One of the benefits of having a Kanban feature is it simplifies the way you see your inbox. 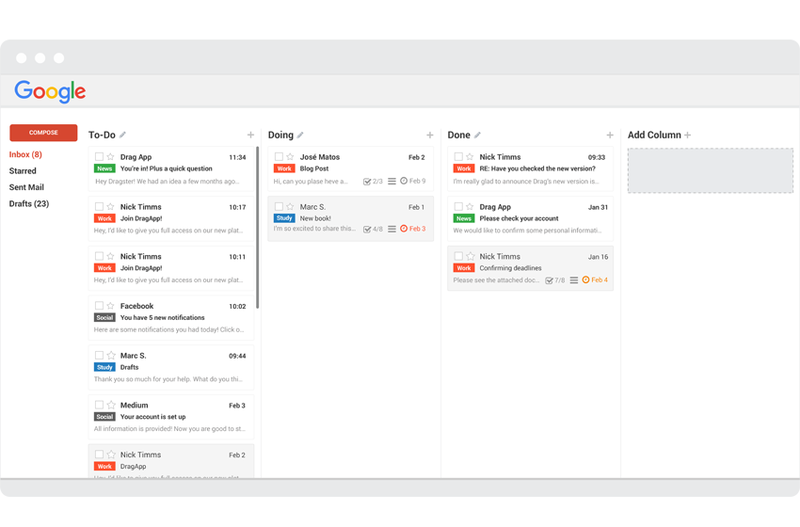 With Kanban, your email can be organized into multiple boards and lists to provide context on what you need to get done for the day or future date. With the drag and drop feature of the user interface you can create customized checklists by dividing tasks into subtasks for you and/or your team with comments/notes, due dates, shared boards and more. You can also use the shared inbox feature by creating different Gmail accounts for different departments of your company, such as sales, marketing, customer service, etc. Once you create the email account, it can be shared by everyone in that department just like their own email. The integration of Google Calendar automatically adds emails or tasks which have due dates attached to them by synching with Drag. This gives everyone in your team the dates of when projects are due all within their inbox. Last but not least, Drag lets you have real-time chats internally or on any shared emails or tasks. Being able to communicate on an important matter while you are still in your inbox lets you address issues right away and resolve them in a timely manner. You can try all of the features Drag has to offer free for 14 days. After the trial period, you can get the Solo version for $5 per month or the Team version for $12 per month with annual billing. The monthly price goes up to $8 and $15 per month respectively for the two tiers. Beta pricing is also available for $3 and $9.36 with annual billing, which goes up to $5 and $11.70 for a monthly subscription.